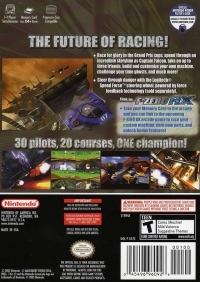 Box Text: The future of racing! Race for glory in the Grand Prix cups, speed through an incredible storyline as Captain Falcon, take on up to three friends, build and customize your own machine, challenge your time ghosts, and much more! Steer through danger with the Logitech Speed Force steering wheel, powered by force feedback technology (sold separately). Take your Memory Card to the arcade and you can link to the upcoming F-Zero AX arcade game to race your customizable machine, earn new parts, and unlock bonus features! 30 pilots, 20 courses, ONE champion! 05-14-2014 heavengeance Box Text The future of racing! Race for glory in the Grand Prix cups, speed through an incredible storyline as Captain Falcon, take on up to three friends, build and customize your own machine, challenge your time ghosts, and much more! Steer through danger with the Logitech Speed Force steering wheel, powered by force feedback technology (sold separately). 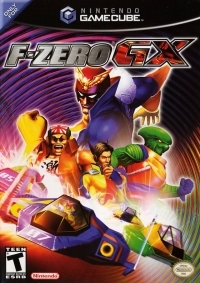 Link to F-Zero AX Take your Memory Card to the arcade and you can link to the upcoming F-Zero AX arcade game to race your customizable machine, earn new parts, and unlock bonus features! 30 pilots, 20 courses, ONE champion! 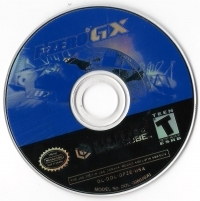 This is a list of VGCollect users who have F-Zero GX in their Collection. This is a list of VGCollect users who have F-Zero GX in their Sell List. This is a list of VGCollect users who have F-Zero GX in their Wish List.